"Maybe it's time the great House of Rey came to an end. After all, what are we now? 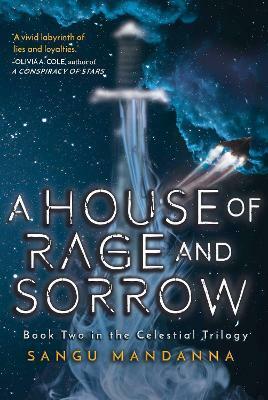 Just a house of rage and sorrow." Esmae once wanted nothing more than to help her golden brother win the crown of Kali but that dream died with her best friend. Alexi broke her heart, and she vowed to destroy him for it. And with her sentient warship Titania beside her, how can she possibly fail? As gods, beasts, and kingdoms choose sides, Alexi seeks out a weapon more devastating than even Titania. Past lives threaten the present. Old enemies claim their due. And Esmae cannot outrun the ghosts and the questions that haunt her. What really happened to her father? What was the third boon her mother asked of Amba? For in the shadows, lurking in wait, are secrets that will swallow her whole. The House of Rey is at war. And the entire galaxy will bleed before the end. Sangu Mandanna was four years old when an elephant chased her down a forest road and she decided to write her first story about it. Seventeen years and many, many manuscripts later, she signed her first book deal. She is the author of the Celestial trilogy, which draws on the Mahabrata and Indian mythology. Sangu now lives in Norwich, a city in the east of England, with her husband and kids.